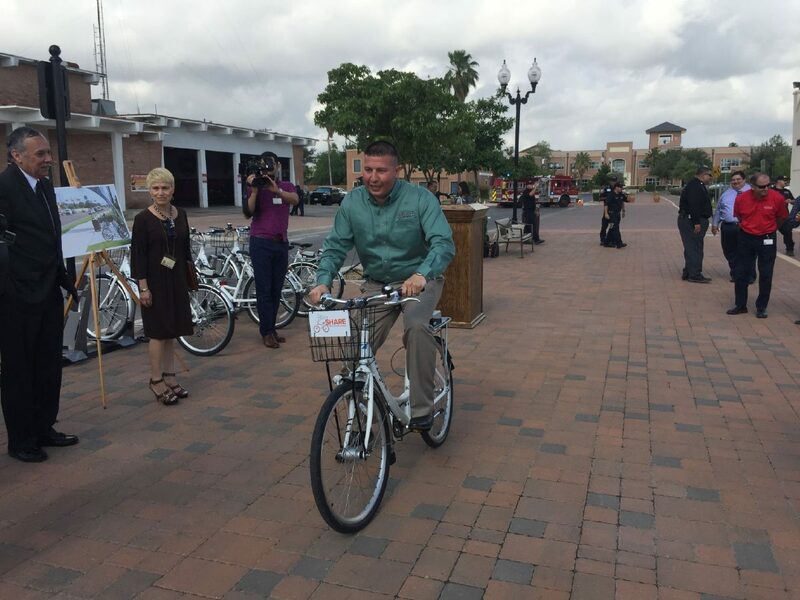 Edinburg kicked off its new bike-share program this week. In an effort to improve mobility and transportation regionally, the Lower Rio Grande Valley Development Council board last month committed to unifying bike-sharing programs. Currently, McAllen utilizes BCycle while Harlingen, Edinburg and Brownsville contract with Zagster — bike-sharing programs that allow residents to rent bikes at docking stations throughout the cities. The new dockless system would allow for the rental of bicycles without the hassle of returning the bikes to a specific city or docking station. Instead, residents could leave a self-locking bike in a designated area where a docking station is not present. The LRGVDC found that BCycle was the most “optimal” system currently used in the Valley, according to Executive Director Ron Garza. Zagster’s contracts with the cities end in August, leaving Harlingen, Edinburg and Brownsville open to potentially contracting with BCycle like McAllen. Though the dockless systems do not need to coincide with BCycle, Garza said the long-range plan is for cities to adopt BCycle. The dockless system will be free for cities, and come at a low cost of about $1 an hour to those renting the bikes — monies that go to the company owning the dockless system. So far, 15 cities have shown interest in the dockless system, with the potential launch date slated for September. “We’ll end up developing this network of cities with the same service,” Garza said. Though bike-sharing is typically used recreationally in the Valley, the goal is to potentially alleviate transportation gaps, according to Garza. The dockless network would allow for a more fluid transportation system in the region, since bicycles could likely be picked up or dropped off near public bus stops. “This has really been a great collaboration of city leaders, city administration, city managers,” Garza said of the move toward a regional system, which has been discussed since late last year. Currently, Houston and Austin use a dockless system. The council will accept proposals from companies owning dockless systems before a decision is made.